What’s Happening in Birmingham this April? 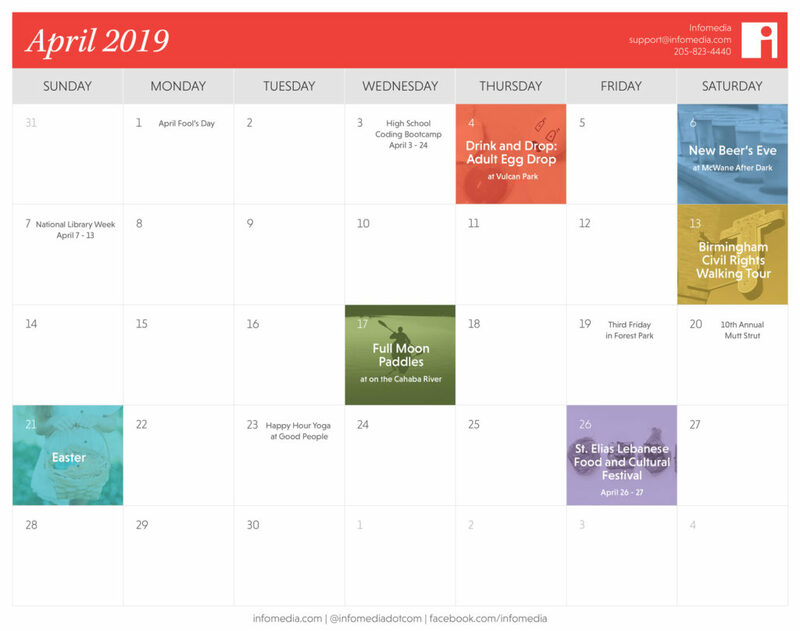 Find Out with Our Free 2019 Calendar | Infomedia, Inc. The weather is warming up and all the plants are blooming, which makes April a great month to hit up all the fun events planned around Birmingham. From an adult egg drop at Vulcan Park to a Civil Rights Walking Tour, keep up with all the happenings by downloading our free calendar. Plus if you run your own business’s social media, our calendar can help you keep track of important dates for posting on social platforms. Get silly, and maybe pull a prank or two, on this day designated for foolishness. If you have a teen interested in learning to program, this High School Coding Bootcamp series at the Homewood Public Library is a great option. It begins April 3 and runs through April 24 with a class every Wednesday. Laptops are provided and no previous experience is required. Relive your elementary school glory days by participating in the egg drop competition. Teams and individuals will build contraptions to see if they can manage to keep an egg safe from the 124-foot drop from Vulcan’s pedestal. The event will also include craft beer, food trucks and live music. Celebrate the anniversary of Franklin D. Roosevelt legalizing beer in the midst of the Great Depression by coming out and learning about Birmingham’s great beer brewing scene. Local favorites, including Cahaba Brewing Company, Ghost Train Brewing and Interstellar Ginger Beer will be there to present the science behind their beers. The event is 21+ and will feature trivia, demos on how to brew at home, food trucks and music. Learn more about Birmingham’s history and soak up some sunshine during a free walking tour put on by the Birmingham Civil Rights Institute. Get a nocturnal view of the Cahaba River by joining a nighttime kayak tour put on by Treeline Expeditions. The two hour adventure will take place on a calm section of the river and be lit by moonlight and fireflies. Explore the Forest Park neighborhood during their special Third Friday event. Shops and galleries will be open later, along with restaurants offering dinner specials. Bring your furry pal out to the 10th Annual Mutt Strut at UAB’s Campus Green. The day will include a dog-friendly 5k and 1 mile fun run along with other entertainment like food trucks, vendors and raffles. End your weekday with some yoga and beer during Good People Brewing Company’s Happy Hour Yoga event. The cost includes a craft beer after the class. It’s the 20th annual St. Elias Lebanese Food and Cultural Festival, so there’s no better time to come out and get familiar with this pillar of Birmingham’s Lebanese community. The event will include a menu of delicious Lebanese food, traditional dancing, free church tours and more. A quarter of the proceeds will be donated to local charities.